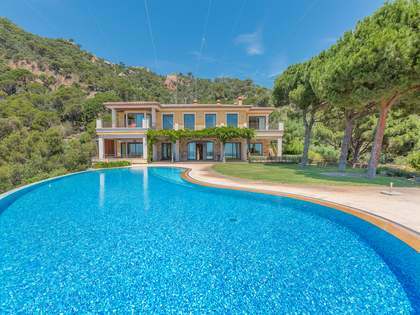 Spectacular seafront villa in one of the Costa Brava's most highly sought after and exclusive residential estates. 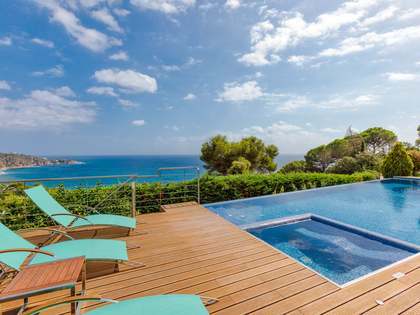 Contemporary-style 449 m² villa in a dramatic clifftop location, 95 metres above the sea in one of the Costa Brava's most exclusive residential estates and boasting some of the most breathtaking 180 degree panoramic sea views of the entire coastline. 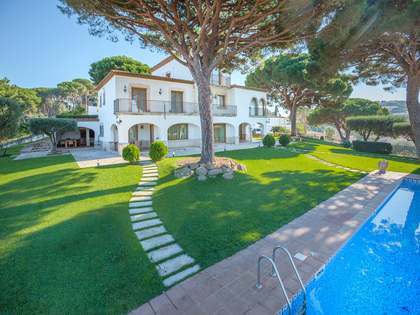 The quaint coastal town of Sant Feliu de Guixols with all of its amenities is just 5 km away and there is a small path that leads from the house down to the sea. Built in the year 2000 and designed by Architect Jordi Garcés, the villa has front and rear terraces surrounded by steep cliffs and pine trees with the sea below. A deep blue swimming pool is located on the sea side of the house and has a floor-to-ceiling glass wall that provides a spectacular feature as you descend the staircase inside the house. The lower level houses a reception area which is overlooked by the glass wall of the swimming pool, and the bedrooms. On one side of the wall is the master suite which comprises a large double bedroom with beautiful sea views and access to a private terrace with exterior shower, a walk-in dressing room, a large bathroom with bathtub - all enjoying spectacular views, and a gym. The guest bedrooms include a double bedroom with en-suite bathroom and 2 further bedrooms sharing a bathroom. All bedrooms have sea views. As well as offering good rental potential, this would make an exceptional holiday home for someone who values tranquillity, privacy and the sea. Ideally suited to a couple or a family with grown-up children. Seafront property, on top of a cliff with access via a small path to the sea below. The residential estate is 5km from the seaside town of Sant Feliu de Guixols with its market, shops, restaurants and marina. The nearest airport (Girona) is 34km away and Barcelona city just 105km away.